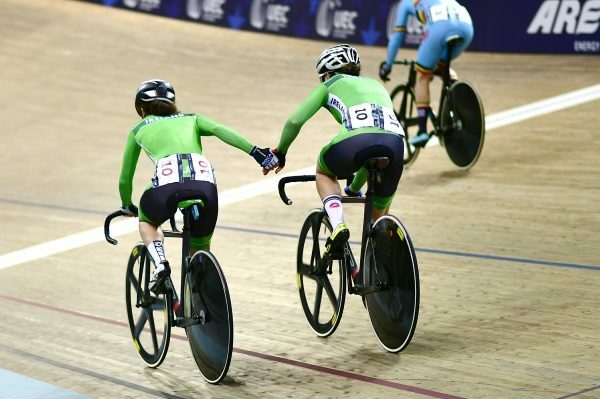 The two Lydias – Boylan and Gurley – have come up trumps for Ireland with the ride of their life at the European Track Championships in Berlin this afternoon. After a testing few days at the European Championships in which strong rides were thicker on the ground than medals, Ireland have finally broken through. This time the Madison pairing of Lydia Gurley and Lydia Boylan came through for a silver. They were beaten only by the British pairing of Elinor Barker and Ellie Mae Dickson. The British pair won on the final sprint, with the Irish women taking silver. Gurley and Boylan managed to gain two laps and were leading going into the final sprint. However, when the British won that sprint and Ireland failed to place; the European crown slipped from Irish hands. The Team GB pair took the title with 58 points, with Ireland on 50 and the Netherlands on 46 points. It is Gurley’s second medal on the big stage, having won bronze in the scratch raced at the World Cup in Colombia back in February. And the medal today is Boylan’s first at a major meeting or championships.